You never know if and when you may find yourself in a survival situation. If that happens, you simply need to have proper equipment with you. Bushcraft Survival Black is a sturdy and strong knife with a 1/8-inch (3.2 mm) thick blade. 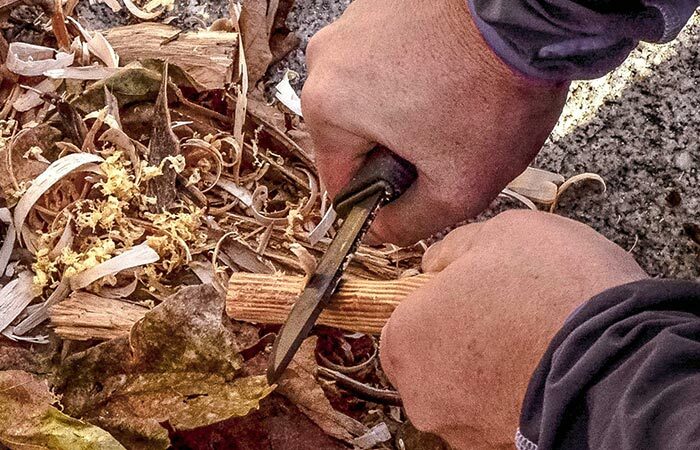 One side of the blade is very sharp and you can use the other side of it to start a fire, which you’ll need to do if you want to survive out there in the wild. This knife is made in Sweden and comes with a life-long warranty, so that should tell you how confident the makers are about the quality of this product. This 1/8-inch (3.2 mm) thick carbon steel blade comes with a black plastic case. The entire blade is made of steel and is covered with an anti-corrosive black coating, so you can use it in literally any weather condition. This blade is 4.3″ (109 mm) long and the entire knife, including the handle, is 9.1″ (232mm) long. The whole thing weighs just 5.4 oz (154g), so it’s very practical and easy to carry. Bushcraft Survival Black comes with a black plastic case that will keep it safe and sharp at all times. Also, with it, you’ll get a fire starter and an integrated diamond sharpener, so you will be able to keep your blade perfectly sharpened and ready for every possible survival scenario out there in the wilderness. The blade is completely covered with an anti-corrosive coating. The ergonomic handle is equipped with high-friction rubber grip, so you don’t have to worry about the knife slipping out of your hands. 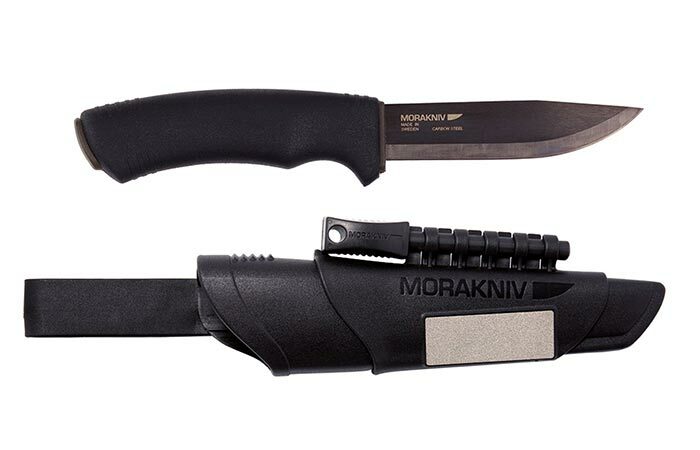 This comes with Morakniv Fire Starter that can produce up to 7,000 strikes and 3,000-degree sparks. Also, it can start a fire even during wet conditions. 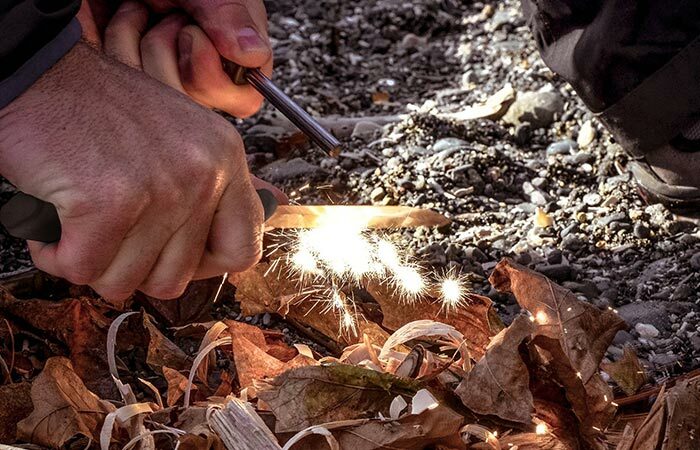 This Bushcraft Survival knife comes with an integrated diamond sharpener and a fire starter. Although this knife has an anti-corrosive black coating, you should take good care of it. You can easily do that by cleaning and wiping the knife dry plus and oiling the blade after each use. This will prolong the life of the blade. This knife has an ergonomic handle with high-friction rubber grip. 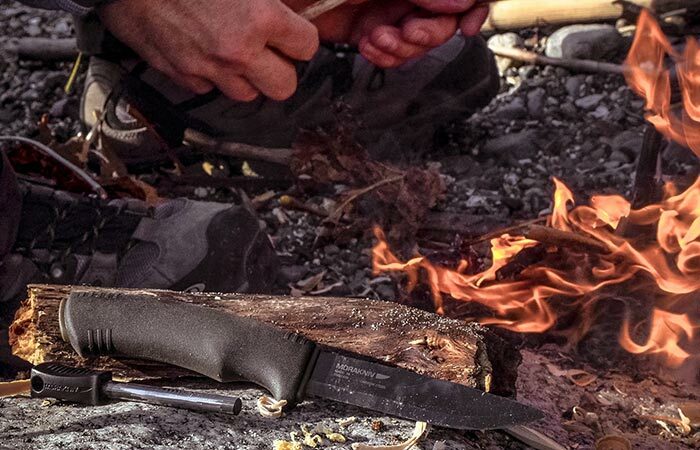 Check out this Bushcraft Survival Black knife in action here.